With ultramodern warehouse and automated warehouse management systems, we carry out excellent supply chain management. This helps us in meeting voluminous requirements. As we are supported by wide distribution network and fastest transportation facilities, we deliver the orders on time. 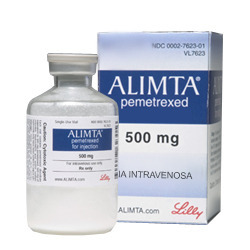 Details : Alimta contains Alimta Pemetrexed. (Pemetrexed) is a chemotherapy injection used to treat two types of lung cancers: non-small cell lung cancer and mesothelioma, a rare cancer associated with asbestos exposure. This cancer medication works by slowing the growth and spread of cancer cells in the body.